I've been gluten free for a few years now, and it's been a good thing. But persisting health problems have led me to understand that my life should probably be completely grain free from here on out. For the most part I tolerate this pretty well. I'm a good cook and I enjoy experimenting so I don't generally feel too deprived. Except once a month. Once a month I turn into a carb monster and all I want is a plate of pasta, a loaf of bread, a triple layer chocolate cake and plate full of cookies. It's terrible. 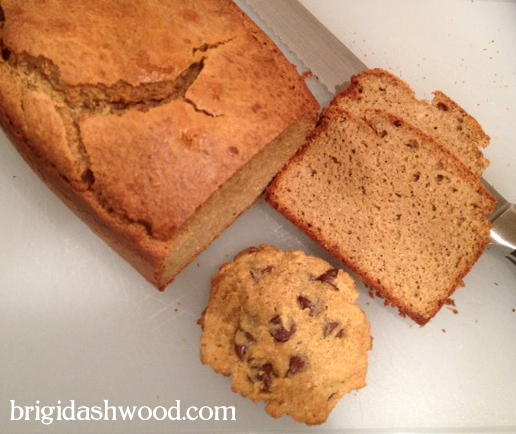 So I've been on the hunt to find the best recipes for Grain Free bread and Grain Free chocolate chip cookies. I've done a lot of experimenting and trying out different recipes and last night I believe I've found the two most promising and tasty recipes so far. I'll share them here with you and if you make these recipes please share with me your process, any substitutions and your results. I'd like to write about this for GeekMom and it would be great to have some additional voices regarding the recipes. Sadly my base requirement with Grain Free recipes is that they "not be disgusting". I consider it a bonus if they are actually tasty. These recipes are both, in my opinion - delicious. The Bread recipe is this one, from Against All Grain. It uses whipped egg whites for lift and cashew butter for substance. I don't like cashews but I do like this bread. The flavor is a mild to moderate nut flavor. Plain, it has a nice texture. Toasted it's very nice. The tooth feel is nothing like a good sourdough, but is as close to traditional bread as any grain free bread I've ever made. It is similar to an artisan style "cake-bread", and as toast would be a slightly fragile, but fantastic vehicle for both sweet and savory toppings. This Chocolate Chip cookie recipe is from Wicked Good Kitchen. My cookies didn't seem to cook up the same way as those in the photo on WGK's website. But they are delicious. Next time I'll play with times a little and see what I can come up with. The cookies are fab however and even the dough - the DOUGH - was scrumptious.